I think one of the most influential cycles of my adult life is connected to my husband's depression. We're just coming out of a recent low phase that was made more intense by the birth and death of our middle daughter and the recent birth of our son. I'm hoping we're entering an 'up' now: we're starting a new business and I think it will give us a great deal more control over our general circumstances and more specifically with how my husband's mental state can be channelled. Thank you for letting me know about Intuitive Tuesdays, lots of food for thought! Today's card is the Five of Cups (Reversed). Fives indicate a shift in stability, upsetting the balance, struggle, adjustment, conflict, adversity challenge and uncertainty. In its upright position, it can indicate a period of mourning, loss, disappointment and regret. But when the Five of Cups is reversed (upside-down), it indicates that the pain is ending (thank goodness), that there is some hope and you are in the process of making sense out of the changes and crisis that you have endured. After Isis, the period of a low cycle in your husband's depression, the death of your daughter and birth of a son all sound like a period of changes, crisis, mourning and spilled emotions (the energy of the Five of Cups). The suit of Cups indicates emotions, and on the card above (in its upright position), you can see that three of the cups are overturned, while two remain standing. You are in a period of adjustment from all of the emotional turmoil you have been through. If the cups have seemed to be half-empty, they are beginning to feel half-full. This is probably due to a combination of several factors. First...time really does help in the healing process. In addition, new situations may have contributed to your new outlook. Combine this with the feeling that the Wheel of Fortune is spinning to the next phase, and you now have glimmers of hope as to what is next and the ability to handle anything that comes your way. In your comment above, you spoke of both the upturned cups (depression, death, etc.) and the cups that remain full (new son, new business, etc.). The key to moving forward is to take it one step at a time and realize that life does have its cycles and your job is to find the middle ground no matter where you are in the cycle. The symbolism and meaning of the Five of Cups speaks to all of us. What cups (emotions) are you happy to release? Which cups (emotions) do you want to stay upright and full? As you move forward, stay attuned to your emotions, and remember that this is just one stage of the cycle. What a wonderful card for After Iris. I hope that life is on a upswing for her. I'm really glad your decks are still upside down :) This card resonates for me after our loss last month and the renewed hope of this month. I'm glad Iris is on the upswing and finding stability. I have been working a lot on balance poses in yoga lately. I always thought yoga was about flexibility, but now I also see that it's about being centered and stable, even amid chaos on the outside. So this is a timely card :-). Funny how just last week I got the 5 of Cups, and now here it is again in reverse. 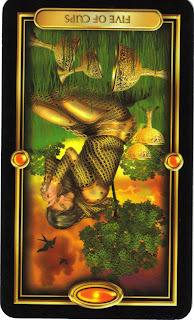 My friend Ailey may comment, because she had also drawn the 5 of Cups, and so I'll bet she's glad you pulled this one. I just had to remark on the power of your writing, Sheri, and how it's growing. I feel your voice through your written word. Thanks for pulling this wonderful card! P.S. Thanks for your comments on my blog. I loved the story about the whack-a-mole-monkeys. You've handled your capuchins so much more gracefully than I mine. And I do love those big laughs, which is something I experience a lot around you and your beautiful sisters! I think it's quite providential that Sherri chose Iris to pull the second card for. Things do appear to be moving into a new cycle for Iris. I'm hoping the same is true in my situation as well. I did pull the 5 of cups a bit back, and it was a clarifying card after I pulled the 10 of swords and was initially VERY upsetby this combo. Sherri can attest to that. Clearly I am quite a novice at this whole tarot thing. But many hours later, after running through all sorts of scenarios in my mind, something rose to the surface that made sense and really seemed to fit. Then these two cards this week just seem to add to the plot line of my life. So time will tell and we will see. Your point about maintaining equilibrium no matter what cycle we are in is the biggest message tho, isn't it Sherri? What a great card for Iris! I think we can all use a card like this. I know I can!